This block is one of four needed to complete a wall hanging called Cosmos, designed by George Siciliano. It is a wonderful twist on the log cabin block. Once you get the hang of it, it comes together fast. Fabrics are sewn onto a special foundation paper. I took a one-day class with George and Virginia Siciliano last September in Provo, UT, during the Utah Quilt Guild show. They are awesome (and fun) teachers! I usually finish all work I learn in classes, and this is the one I am yet to finish... The colors and fabrics are great to work with, the pattern is well written and easy to follow. I just need to make the time, as once I start on it again, I will not stop until I am done! 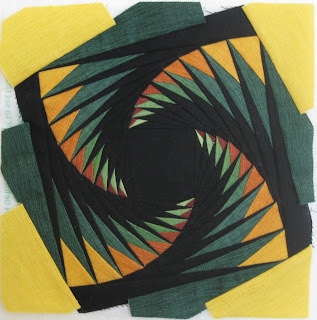 George's designs are amazing, and Virginia's quilts (and hand quilting) are exquisite. You've got to check them out!